What if your house could shift from constantly cluttered to clutter free without complicated routines to get it and keep it that way? Well, it can–if you are willing to develop decluttering habits to replace your current clutter habits. Habits are powerful tools allowing you to do routine tasks with little thought–tasks like tossing clutter on a continual basis. In this article, which reviews the book The Power Of Habits: Why We Do What We Do In Life And Business, the “habit loop” is explained. Basically to form a habit you need a cue, a routine, and a reward. For instance, let’s say you want to start taking vitamins regularly. To set a cue, you leave them out on the kitchen counter where you can see them (physical cue) you then start taking them each morning after breakfast (routine), soon you start feeling more energetic throughout the day (reward). The reward of more energy then strengthens your desire to keep your routine until it becomes a habit so ingrained you don’t even need to keep the vitamins on the kitchen counter anymore, you now just automatically think of taking them the moment you finish breakfast. So how long does it take to create a habit loop? In The ONE Thing: The Surprisingly Simple Truth Behind Extraordinary Results the author shares a study by the University College of London that states that it takes on average 66 days to form a new habit. Since that is an “average” my snail pacing self-says, “Give yourself 90 days to form a new habit.” Why 90? First, it seems like an easier number to remember than 66. Secondly, 90 days is essentially three calendar months, give or take a day or two, so you can set goals to form a new habit every three months–allowing you to aim for four new habits a year. Want less clutter in your home? Read the list of 10 decluttering habits below and pick one to develop over the next three months. When you are done with that one choose and create a habit loop for another. Repeat until you have developed enough clutter tossing habits to keep your home organized. Buy a new shirt, give one away–right away. Buy new jeans, donate a pair–before you even get a chance to wear the new ones. This goes for replacing broken items too; throw the broken ones away before you even purchase the new ones. Admit it: how many times have you bought a new item to replace a broken one and then never gotten around to tossing the unusable item away? I know our family has. One example that comes to mind is when our washing machine broke down. We bought and hauled a new one down to our basement, but were too tired that evening to haul the old broken one out. That broken machine sat in our basement for six months before we finally made it a priority to get rid of it. Clutter grows because we don’t prioritize attacking it on a regular basis. An excellent way to keep your clutter away for good is to schedule 15 minutes a day to attack it. Perhaps right after your morning coffee or the first 15 minutes you get home after work. 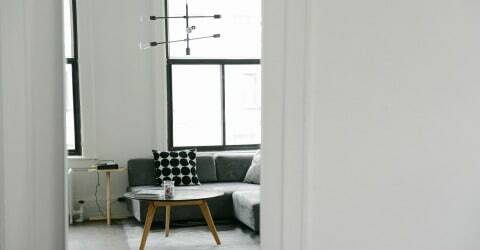 For most homes, this will keep clutter from growing and it might even shrink a pile or two over time–depending on how much clutter you have and how large your home is. This is a very simple habit to create and can be used to either rid your home of clutter or keep it clutter free. All you need to do is pick a number. Now toss that number of items each day, six days a week (you get a day off for good behavior 🙂 ). 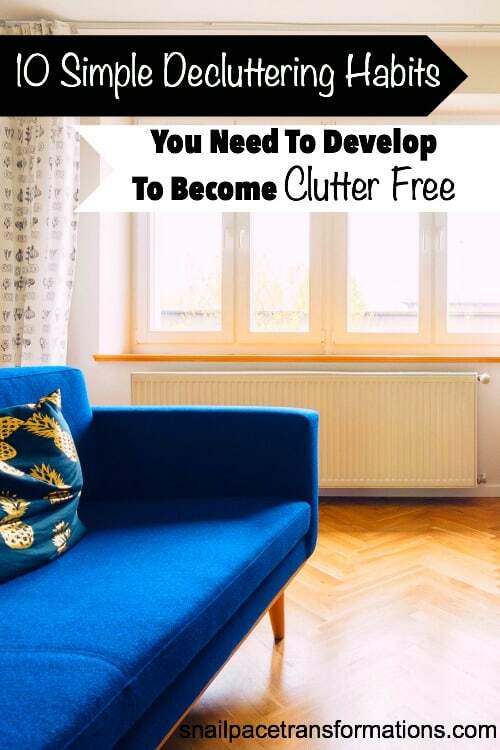 The more clutter you have the higher number you should pick. Make sure to have a box ready to collect items that are in donation worthy condition. 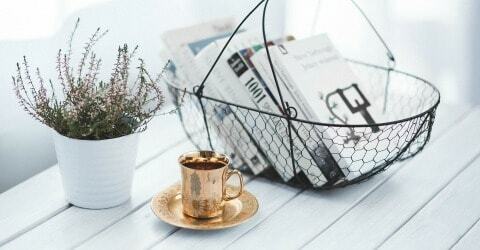 I made a huge dent in my grief clutter when I sat down and wrote out a plan to attack one area of our home each week for 52 weeks–you can too! Just grab a pen and some paper and walk around your home writing down cluttered areas you think you could attack in one afternoon. For me that was a bookshelf or a bathroom cupboard. Keep the areas small so you can get that feeling of reward every time. If you have more time and you feel like it, then by all means keep tossing that clutter. 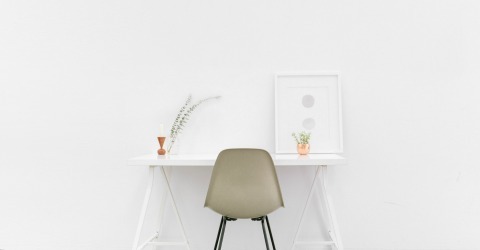 However, if you don’t feel like tossing clutter that weekend, do your agreed upon area anyway–no excuses. Trust me, developing grit will pay off. Perhaps you brain just doesn’t work in areas like mine does–all you can see is a huge room of clutter. If that is you, then try the timer method for weekend decluttering sessions. Make yourself stick to decluttering for 90 minutes at the same time every weekend. Pick a room to begin in and then go at it weekend after weekend, 90 minutes at a time until it is done. And again if your timer goes off after 90 minutes and you feel like you want to work longer, then go for it! But always do at least 90 minutes. Housekeeping tip: There is just something about watching an old fashioned kitchen timer, instead of the one on your phone, count down to motivate you to work faster; you might want to consider investing in one. A lot of clutter is essentially paper and items that never got put away correctly. To keep these two types of clutter from growing out of control, a daily tidy up is essential. A perfect time for this is right after dinner. If you can get all the members of the household involved in the tidy session. Assign each person an area, and then set the timer for 15 minutes and put as many items as possible back in their proper homes and stack the miscellaneous papers up in a basket to deal with later (more on paper handling in a minute). This habit right here is a HUGE game changer for those who are not great at putting things away the moment they are done with them–please tell me this isn’t just me. When I follow this rule, messy, every day clutter is kept to a minimum. Dirty socks are picked up on the way from the TV room to the bathroom and put in the laundry bin found there. School books found on the dining room table are transferred to backpacks found in the kids’ rooms on the way to my bedroom. Random garbage is regularly taken out of my car and placed in the kitchen trash because this habit applies to vehicles too. For me, putting stuff back the moment you are finished using it is a habit I still need to form. I am better with rule seven, which makes me put stuff back as I move from room to room. However, after observing my tidy friends I noticed that this rule is a major game changer in the clutter department. Following this rule right here appears to be how they keep their homes tidy 24/7 with minimal effort. There is some ground work to do before you can create this habit; you have to assign everything a place. To assign everything a place you first have to decide if you need it in your home in the first place. So this habit is for maintaining areas you have already decluttered. Housekeeping tip: Tired of hearing the excuse “I didn’t put it away because I didn’t know where it went”? Buy a label maker (our family has one made by this brand) and label homes for everything–it will kill this excuse. Oh, and if you are like me and you like having all you need for a current project at hand, here is my adaptation of this rule for projects. I create an ongoing project box, basket, or bin depending what the supplies for my current project fit best in. The container holds all I need to complete my project and sits in the room where I am working on it until I am done. When I have time to work, I can grab my project bin and get to work. When I am done with work for the day, I make myself put all the tools and supplies back in the project bin. The bin is my project pile tamer. Best part: when we are cleaning up for guests, I just have to pick up the container and move it to my room temporarily. Easy-peasy. Sometimes we have the best of intentions. We box up stuff to give away and then those boxes themselves become hallway clutter as they sit there month after month waiting for us to finally put them in our vehicles and drive to the donation site. You can avoid this clutter by setting a regular day each month that you drop off at least one box to your local thrift store. Here is the bonus of creating this habit: you now have a goal of tossing at least one box a month of items you no longer need. If you live in a larger area, you may be able to automate this goal by calling thrift stores in your area and seeing if one offers free pick up of donations, some even allow you to set a recurring pick up day. When you gather the mail walk right to the recycling bin and toss junk mail in it. Place a paper shredder (our family has this one and have been happy with it) near your recycle bin so you can shred unnecessary paper with personal information at the same time. Finish off you mail sorting by putting papers you need to keep in a basket. Don’t let that basket grow too high! Once a week at least deal with those papers–file, mail, pay, etc. Make a habit of also doing this with the papers you kids bring home from school. This should reduce the amount of paper found around your home during your after dinner tidy (number six), however, paper does seem to reproduce all on its own. Don’t allow that basket to hit the brim. When it is getting close, use the next daily 15 minute decluttering session to tame it. 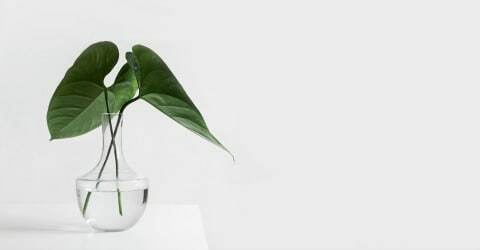 Got another simple decluttering habit people can develop? Share it in the comments below. Need decluttering support? Join the Snail Pace Clutter Removers Facebook Group where women cheer each other on in their decluttering journey.